Three decades ago, the Reagan administration followed Israel into the middle of the Lebanon civil war with disastrous results, including the deaths of 241 U.S. servicemen and a U.S. withdrawal. Now, the Obama administration faces a similar choice regarding the Syrian civil war, as ex-CIA analyst Paul R. Pillar writes. Expressions of angst over Syria have entailed several themes, one of which concerns possible “spread” of the Syrian civil war into nearby states. Lebanon, for reasons of physical and ethnic geography, is most often mentioned as a locale of such spreading. But at least as useful as speculation about what the Syrian civil war may do to Lebanon is to reflect on how current events in Syria are echoing an earlier civil war in Lebanon. We have been through much of this before, 30 years ago, when Ronald Reagan was president. By the early 1980s Lebanon had been suffering several years of combat among sectarian militias, reflecting disagreement over the fairness of old power-sharing agreements among the confessional communities. The biggest stirring of this already turbulent pot came in 1982 when Israel invaded Lebanon. The principal Israeli targets, declared targets, at least, were fighters of the Palestinian Liberation Organization who had been in Lebanon ever since being kicked out of Jordan a decade earlier, after losing the Black September confrontation with King Hussein. A small multinational force of U.S., French and Italian troops entered Lebanon in August 1982 and supervised the extraction of the PLO to Tunisia before itself withdrawing to ships in the Mediterranean. Israeli objectives were not limited just to booting the PLO out of Lebanon, however, and Israeli forces remained enmeshed in the sectarian fighting, besieging Beirut. Israeli Prime Minister Menachem Begin had ideas about trying to maintain a client to the north in the form of the pro-Israeli Christian government of Bachir Gemayel, who became president about when the PLO was leaving. Three weeks later Gemayel was assassinated, triggering the most horrid blood-letting of the Lebanese war. At least several hundred, and by some outside estimates perhaps something closer to 2,000, Palestinian civilians were slaughtered in the Sabra and Shatila refugee camps. The massacre was carried out by the Christian Phalangist militia, which was allied to and supplied by the Israelis. Israeli forces facilitated the massacre by maintaining a cordon around the area of the camps, and fired illuminating flares that enabled the Phalangists to continue their work by night. The massacre stimulated the Reagan administration to organize a new multinational force that eventually included 1,800 U.S. marines as well as French and Italian troops. The force initially had some success in acting as a buffer between contending elements. But the intervention later became a textbook example of the near-inevitability of getting drawn into ever costlier commitments and endeavors in any situation as messy as Lebanon at that time. U.S. military engagement included not only the marines on the ground but also combat between carrier-based U.S. aircraft and Syrian forces (which had originally entered Lebanon as part of an Arab League peacekeeping force). 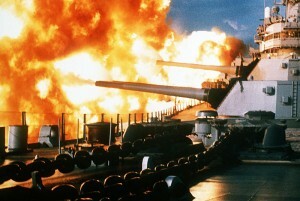 At one point even the 16-inch guns of the battleship New Jersey were brought into action. Those striking back at the increasingly resented foreign forces used methods against which jet fighters and battleships are of little use. In April 1983 a truck bomb was detonated at the U.S. embassy in Beirut, killing 63 persons. Congressional pressure on the administration to withdraw from Lebanon increased. The last U.S. forces left in February 1984. The Lebanese civil war continued for several more years until sheer exhaustion, and a new political accord brokered by Saudi Arabia and Syria, brought it to an unsatisfying end. Some parallels between that experience and the current situation regarding Syria are obvious. There is the overall complexity of the conflict and the presence of bad guys all around. There also is Israel taking advantage of a neighboring state’s civil war to pursue its own objectives, whether those are to smash a Palestinian force or to intercept long-established Hezbollah supply lines, regardless of how much its actions stoke and escalate the war. And if much of the discourse in Washington about Syria since the (presumed) Israeli attacks there over the past few days are any indication, there again is the pattern of Israeli actions increasing the chance of the United States getting sucked into the mess. Let us hope that those eager to get into the mess will reflect more than the statesmen of 1982 did about how this all will end. Moreover, those who talk about damage to U.S. prestige or credibility also ought to think about that aspect of the experience in Lebanon. Withdrawing the U.S. troops in 1984, although it was the least bad thing the Reagan administration could have done at the time, was a U.S. defeat by Hezbollah. There is no way to sugar-coat that conclusion. It was just the sort of caving in to bad guys that we so often hear that we need to avoid. And it could have been avoided in Lebanon if the United States had not gotten involved in the mess in the first place, or at least if Israel had not, in pursuing absolute security for itself regardless of the insecurity it causes for everyone else, made the mess worse. Well, we’re losing our retirement benefits, our healthcare benefits, our public education benefits, our funding for public parks and cultural initiatives, the infrastructure is crumbling and real living wage jobs are disappearing. If we don’t get into a war, how else can we expect to see our tax dollars at work? Incidentally, I was there when that picture of USS New Jersey was taken. It was the pride of Ronald Raygun’s 600 ship Navy. Fat lot of good it did anyone, but the pictures sure are impressive!